Marketing software refers to tools that help businesses successfully execute campaigns, tap into their target markets and convert leads into sales. Companies, regardless of size, can benefit from marketing tools, allowing them to maximize their resources and get rid of repetitive tasks. They are also very useful in expanding businesses’ reach and allow companies to focus on more pressing matters. The success of every business relies heavily on a company’s ability to attract and retain customers. Doing so, however, requires utilizing a cluster of processes such as data gathering, campaign management, lead nurturing, and market analysis among others. This is where marketing software comes in. So, what is marketing software? The definition of marketing software refers to a compendium of systems designed to optimize the way businesses tap into their target market, execute campaigns, and convert leads into ROI. Ideal for companies of all sizes, this technology is useful for eliminating mundane tasks and maximizing your resources. While the cost of marketing software may be steep, it’s a worthwhile investment for those who want to expand their reach and concentrate more on other aspects of their business. Not only does this type of software reduce the amount of time and effort you spend on manual marketing techniques; it can also help you yield more profit as your business grows. Over the years, many surveys and studies have been conducted to monitor the efficacy of marketing software utilization. Among these a report noted that 54% of companies experienced an improvement in their campaigns through marketing software, while 37% attributed the increase in their sales to this technology. Likewise, a VB Insight study showed that 80% of marketing automation users saw an increase in leads upon implementing a software and 77% observed a growing number of conversions. The questions to ask yourself now are “what is marketing software supposed to do for my business?” followed by “how will I know if it suits my company’s operations?” There are many of them available—from applications that let you manage different facets of your business operations with just a few clicks to specialized systems that target specific aspects of marketing. So, if you want to automate some of your processes, rest assured that there are options for your company. Reduces Tedious Tasks. If we focus on the definition of marketing software, we should be able to conclude that it is meant to eliminate repetitive duties that take up a huge fraction of your daily routine. Tasks such as compiling your clients’ information, sending emails to your leads, and scheduling the posting of content can be time-consuming and while they are important, they leave you with little time to focus on tasks that demand your immediate, undivided attention. By utilizing content marketing systems, resource optimization programs, and other marketing software; you can eliminate the hassle of juggling everything manually, allowing you to delegate more important responsibilities to your staff. Streamlines Marketing Efforts. Marketing campaigns require the simultaneous use of multiple channels to communicate with your target audience. Marketing software solutions are designed to help you coordinate various programs in a single, easy-to-manage platform. This means you no longer have to jump from system to system to execute your campaign seamlessly. Most of these applications also offer a full suite of tools that let you manage content, nurture leads, and measure your campaign efforts accurately, promptly, and efficiently. Improves Accountability. When it comes to monitoring or analyzing lead conversions and marketing campaigns, accountability plays an important role. With the use of marketing software, you can eliminate the risk of human error and make sure you get all the statistics you need at a glance. Makes Customer Management Easier. Developing relationships with potential clients at each phase of the sales process is crucial to helping your business thrive. However, this is not as simple as convincing prospects to purchase products or keeping them posted on your offers. Attracting and retaining clientele are extensive processes wherein you must pinpoint the people who will most likely need your services, listen to their concerns, and respond to them on time every time they contact you. By using a CRM software or lead nurturing system, you can effortlessly schedule email campaigns, reply to leads promptly, build a better online presence, and keep tabs on current customers. Document Progress Faster. Tracking your leads, resources, content, and campaign success rates may sound easy at first, but it won’t be as simple when you are dealing with multiple campaigns, handling hundreds of customers, and creating an extensive amount of content all at the same time. Using marketing systems, your company can become more agile in its varied campaign initiatives. You can quickly create accurate progress reports that help you assess the effectiveness of your strategies and determine how to improve them in the future. 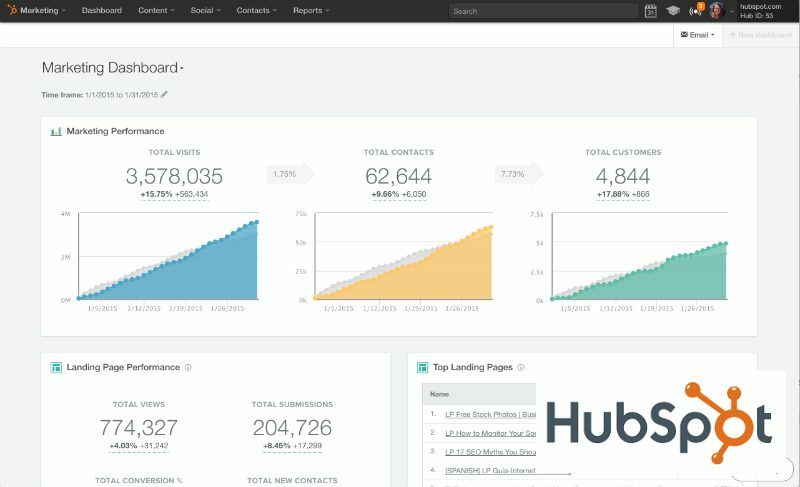 A quick look at your campaign key metrics in HubSpot Marketing dashboard. The purpose of marketing software is to make the jobs of marketers simpler and faster. Over the years, marketing software systems have evolved to stay up-to-date with modern business and communication trends. They are comprised of extensive features that you can use and modify to suit the needs of your business. Still wondering–how does marketing software work? Read on to learn more about its features. Real-Time Alerts. Quick response time is an important factor when it comes to closing deals. With real-time alerts offered by marketing software, you and your sales reps can engage leads more quickly and provide prompt assistance to your existing clientele. Some applications may even offer trigger response features to help you identify and act on your customers’ key life events and transaction patterns. Lead Management. Marketing software can increase sales efficiency and optimize marketing campaigns through the management of leads. With this feature, you should be able to closely monitor and nurture more potential buyers with less difficulty. Lead management applications can also provide you with the necessary information to make personalizing sales outreach a breeze. Additionally, these programs have tools to let you track sales activity and find pipeline trends with just a few clicks. Campaign Management. Creating comprehensive marketing schemes need not be complicated. With countless campaign management systems available, you can get easy access to plenty of integrations and tools to help you organize, track, and analyze the progress of your marketing efforts. Social Media Automation. In the modern age, using social media websites has proven essential when it comes to understanding and interacting with your target market, but studying when and what to post can be demanding. If you wish to simplify this process, social media automation might be the solution for you. Aside from helping you navigate through networks, this feature can inform you about the best time to post, allow you to queue the publishing of your content, and alert you when your brand is mentioned online. Email Marketing. Fast and cost-effective, emailing is one of the best ways to increase brand awareness and stay in touch with customers. However, increasing its efficiency and measurability can be a handful, especially when you have plenty of leads and customers to take care of. By implementing an email marketing software, you can take out the hassle of having to manually sort and send emails and concentrate more on producing targeted messages that pique the interest of your clientele. Numerous programs also have tools to categorize your leads according to demographics and interests, so that you can prioritize certain groups in your email marketing campaign with relative ease. Analytics. Making critical business decisions is a vital step towards improvement, but it must be backed by facts. A marketing software helps in facilitating data-driven decision-making process for your company through analytics solutions. Designed to help you monitor your campaigns and measure your ROI, this feature will collect data for you and present it in a comprehensible manner, so you can take well-informed measures in adjusting your campaigns. Marketo generates visual data, a quick way to get insight on your data. HubSpot Marketing. Focusing heavily on content marketing initiatives, HubSpot is a great option for companies that wish to increase their website traffic and improve their online presence. Their system provides a wide variety of search engine optimization options, social media suggestions, and dynamic email marketing solutions. This marketing software also has features for Salesforce integration, lead nurturing, and event-based segmentation. Offering affordable software packages, HubSpot can be accessed on Windows and Mac as well as mobile devices, so you can check on your marketing initiatives wherever you may be. If you want to know more about the features you can easily sign up for a HubSpot Marketing free trial here. SharpSpring. A leading email marketing software, SharpSpring aims to help small businesses and mid-sized companies interact with their customers in the most effective way possible. The platform is equipped with a plethora of tools for lead management, campaign tracking, behavior-based email automation, as well as analytics. In case you are looking for specific functions that are not yet part of the core features of this platform, SharpSpring also has open API capabilities. This way, you can integrate it with your existing business tools as well as other third-party applications. You can check the solution closely when you sign up for a SharpSpring free demo here. Marketo. A leading marketing automation platform, Marketo specializes in providing solutions for lead management, email marketing, customer base marketing, mobile marketing, and consumer marketing. Their software offers a simple interface with easy-to-use tools to streamline a wide range of marketing-related tasks. It also allows real-time personalization and flexible automation. Infusionsoft. A favorite option among small businesses, Infusionsoft offers a powerful marketing system that can be combined with a wide variety of applications. It is a centralized platform designed to make your campaigns organized and simple. Plus, it offers payment processing, lead scoring, and sales reporting tools to help you reduce staffing costs, grow sales, and save time. PushEngage. A push notifications platform for both web and mobile, created to help sales and marketing teams segment and send web push messages automatically. The software enables sales teams and marketers to group or segment their target audience based on custom criteria such as their landing page URLs, browsed URL history, and location among others. PushEngage then helps users create personalized notifications according to the segmentation results, leading to higher click rates and lowering the number of subscription cancellations. Infinite MLM. An online Network Marketing platform that multi-level marketing agencies with a number of high-end capabilities and features such as e-pin, e-wallet, e-commerce integration, and open cart integration to mention a few. It offers a variety of MLM compensation plans, including Binary, Matrix, Unilevel, Board, Generation, Party, Gift, and Monoline among others. Where are your leads coming from? Infusionsoft lays them down neatly. Security Issues. By using a marketing software, confidential information from your database is readily accessible to anyone in your company at any given time. This holds true especially for cloud-hosted applications. To prevent data breaches, you may need to implement security measures that prevent unauthorized personnel from being able to connect to your marketing system. Difficulties in process integration. Marketing system solutions are created to cut down the humdrum duties that come with every campaign. However, that doesn’t mean that it can automate your tasks from the get-go. No matter how user-friendly this software may be, it still relies on the input of the operator. Meaning, a certain amount of training is needed to be able to integrate this program into your system. If you want to ensure the success of its implementation, you must proactively learn what the software can do and be patient as you adjust to it. Underutilization of staff. Most marketing software can fully automate the various tasks involved in your campaigns. Because of this, overdependence on the program may occur, leading to employee underutilization. If qualified, trained employees are not being used to their full potential, it will have been a waste of your company’s resources. Make sure you wield your workforce wisely by giving them more responsibilities that hone their skills and challenge their creativity.